Yeah, I know. Valentine's was 5 weeks ago. It's taken me a while to work my way through my Lush stash, alright? At least this review will be helpful for any products that return next year or pop up in the Kitchen. This bath bomb was apparently based on Oxford Street's Lava Lamp, which was quickly discontinued (perhaps because it stains the bath!). With red hearts inset inside a simple white sphere, it's really pretty in an understated way. At first, the scent is very subtle but when it's dropped into the bath, that changes completely. Ever wondered what it's like to bathe in Berocca? Me neither, but I think I've found my answer. 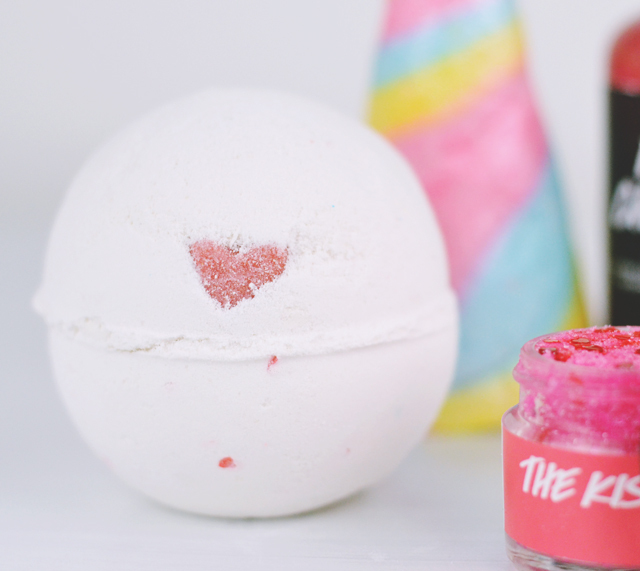 The immediate fragrance released is a very sharp orange but, as the bath bomb fizzes away, the cocoa butter and vanilla mellows out into a creamy chocolate note, resulting in the most delicious chocolate orange scent. It's incredible! Lover Lamp is a moderately fast fizzer and, as it dissolves, red biodegradable confetti is released and melts away slowly in the murky white water. I was recommended to rub the cocoa butter hearts over my skin and my god, that was a fantastic idea! Afterwards my skin felt insanely soft. 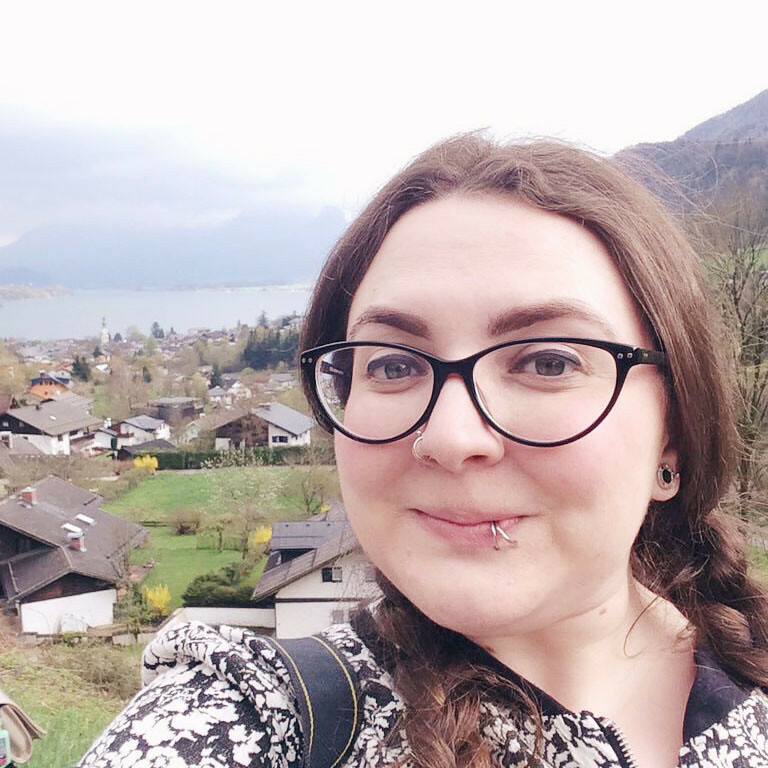 Ok, so admittedly it did stain my skin red for a little, but that soon washed off and left behind super smooth skin. I'm crossing everything that it returns next year because I will be doing some serious stockpiling! OK, so this isn't actually part of the Valentine's range, but I was kindly gifted one at the Lush Southampton event and, for some reason, I've never used Tisty Tosty before. 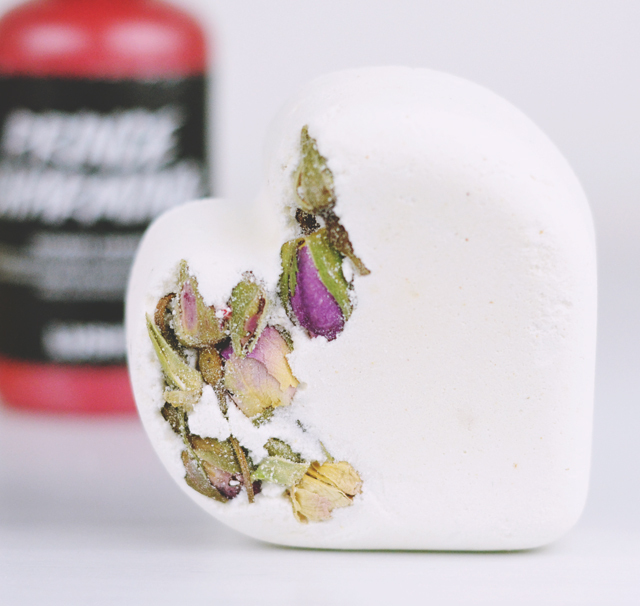 It's simple in appearance, just a white heart with seven rose buds embedded inside- apparently this is based on a medieval love potion. When in the water, it dissolves very quickly and leaves the water cloudy, rather than coloured. As you'd imagine, the fragrance is equally delicate, with a main note of rose but also hints of lemon and jasmine. It's a very subtle scent so perfect for those who sometimes find Lush products a bit overpowering. 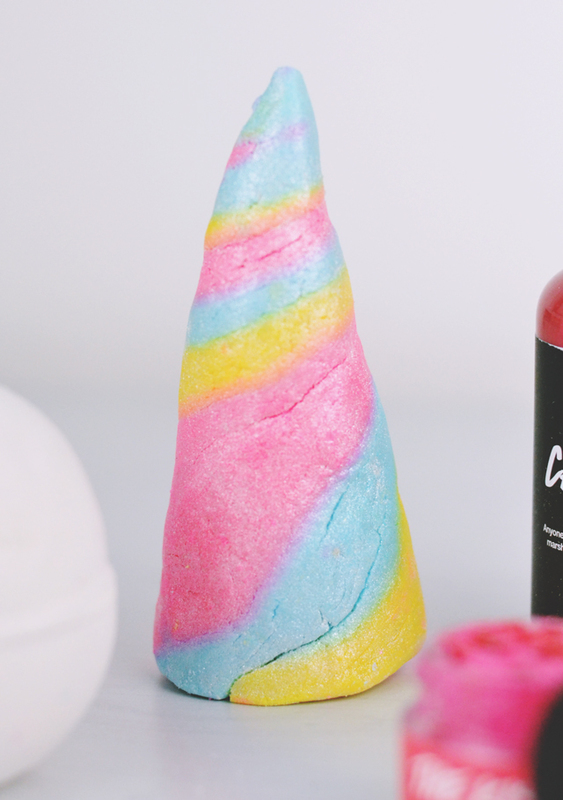 Oh man, I love me a bit of Unicorn Horn! 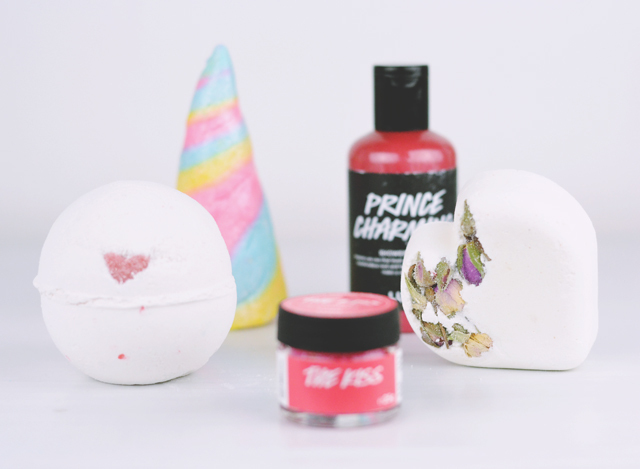 I was so glad Lush brought it back this year as it was one of my favourite products of 2015. They've had a bit of a facelift since last year and the multicoloured, shimmering stripes are brighter than the pastel tones of before. Unfortunately, when the bubble bar is in the bath, these colours swirl together to form a rather miserable grey colour. Despite this, the fragrance of lavender is incredibly soothing- perfect for the end of a long day- and one horn can produce three tubs worth of bubbles if you're careful. I really hope this is going to become a classic Valentine's product because I love it! Last year, I hated Prince Charming. At first, I quite liked it, but I quickly found that the fragrance became cloying for me. Pretty sure it was the pomegranate. 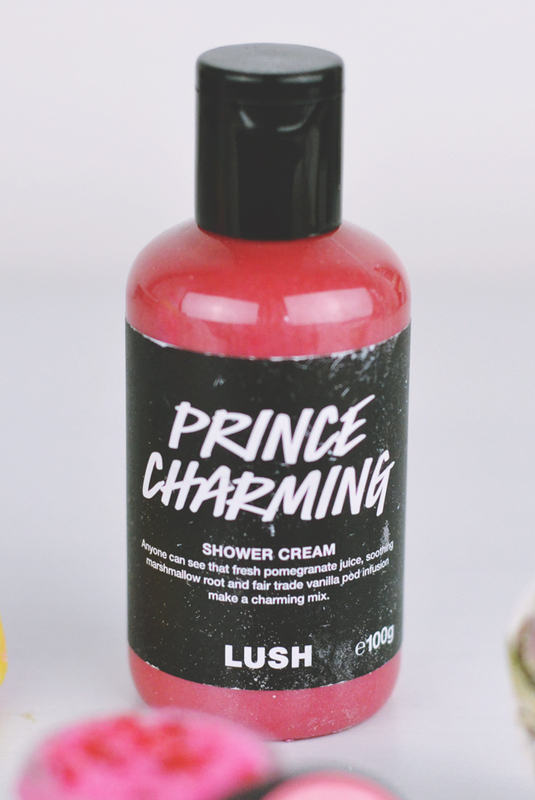 Like Unicorn Horn, Prince Charming has had a little upgrade and is now a shower cream, rather than a gel. This extra moisturising, slightly shimmery cousin of last year's offering was supposed to have a small change in fragrance too. Unfortunately for me, it doesn't smell any different. Yes it's a lovely consistency but I just can't get over that pomegranate. 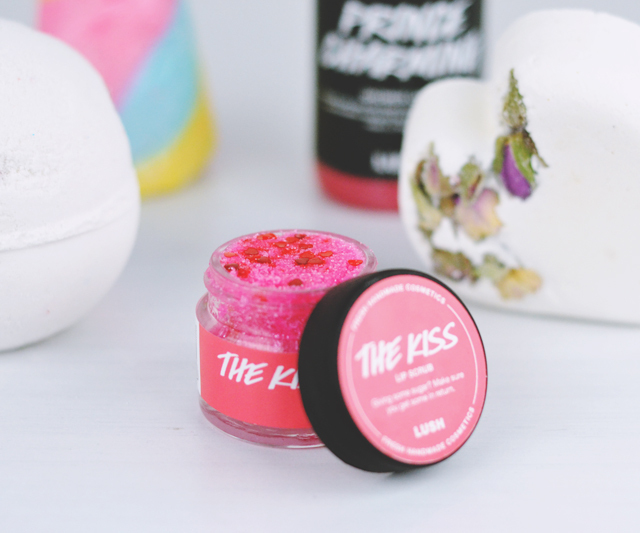 The very first Lush product I ever bought was the Bubblegum Lip Scrub (check out this ancient review I wrote!) Since then, I've tried a few lip scrubs but I've never really got to grips with them. I find them a bit messy, a bit annoying and I always forget to use them before losing them somewhere in the depths of my make up stash. Honestly? I don't think The Kiss will be any different. I'll admit, it has a delicious fruity fragrance of candy mandarins (although it tastes a little too much like a bath product), and the edible hearts are super cute, even if they got stuck to the roof of my mouth. Just a little product rubbed over my lips instantly got rid of the dry skin that had been plaguing me for days, and left them super smooth, soft and tingly. But, at the end of the day, it's just too much hassle for me. I'll keep it on my coffee table and try to remember to use it, but I suspect I'll end up losing this one too. Aaw that's so sweet! Maybe if you ask them, they could make a special one for you?